Brew Con is a convention for brewers - and it hits London on Sunday 12th November, when it will be at Oval Space in Bethnal Green. There will be lots for aspiring brewers to enjoy - talks, workshops, suppliers etc - plus a bar with lots of craft beer, including The Kernel, Five Points, Beavertown and some one-off collaborations! 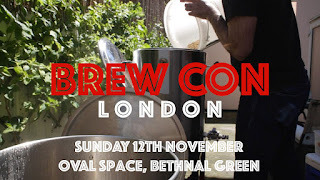 "On Sunday 12th November ‘Brew Con London’ will bring together craft beer, brewing experts, ingredients & hobbyist equipment to Oval Space, in Bethnal Green. The conference and expo will be the first of its kind dedicated not only to the consumption but also to the craft of making great tasting beer. “We have some great exhibitors on board and have a full day’s worth of speakers and workshops planned” said Simon Pipola, beer writer and organiser of Brew Con London. “Understanding how beer is made enables the consumer to truly appreciate the final product”. The past time of making beer at home is undergoing a revolution akin to the transformation the craft beer scene has witnessed in the last decade. Innovation and accessibility of small batch brewing equipment coupled with a far higher quality of readily available ingredients from across the globe has led to a resurgence in the numbers of people brewing beer in the comfort of their own homes, with far superior results." Note - Not 'Oval' in South London. Nowhere near!